Ripping up France’s political map, French voters elected independent centrist Emmanuel Macron as the country’s youngest president Sunday, delivering a resounding victory to the unabashedly pro-European former investment banker and dashing the populist dream of far-right rival Marine Le Pen. Macron, who had never run for office before, celebrated with thousands of jubilant, flag-waving supporters outside the Louvre Museum in Paris on Sunday night. The European anthem “Ode to Joy” played as he strode out to address the swelling crowd. Marine Le Pen, his far-right opponent in the runoff, quickly called the 39-year-old Macron to concede after voters rejected her “French-first” nationalism by a large margin. Le Pen’s performance punctured her hopes that the populist wave which swept Donald Trump into the White House and led Britain to vote to leave the EU would also carry her to France’s presidential Elysee Palace. “I will do everything in the five years to come so there is no more reason to vote for the extremes,” he said. Earlier, in a solemn televised victory speech, Macron vowed to heal the social divisions exposed by France’s acrimonious election campaign. The result wasn’t close: With about 90 percent of votes counted, Macron had 64 percent support. Le Pen had 36 percent — about double what Jean-Marie Le Pen, her father and co-founder of their National Front party, achieved at the same stage in the 2002 presidential election. Macron’s victory strengthens France’s place as a central pillar of the European Union, and marked the third time in six months — following elections in Austria and the Netherlands — that European voters shot down far-right populists who wanted to restore borders across Europe. The election of a French president who champions European unity could also strengthen the EU’s hand in its complex divorce proceedings with Britain. Parisians lined the streets outside Macron’s campaign headquarters to see his motorcade whisk him away to the Louvre party. His wife, Brigitte, joined him on stage after his address. 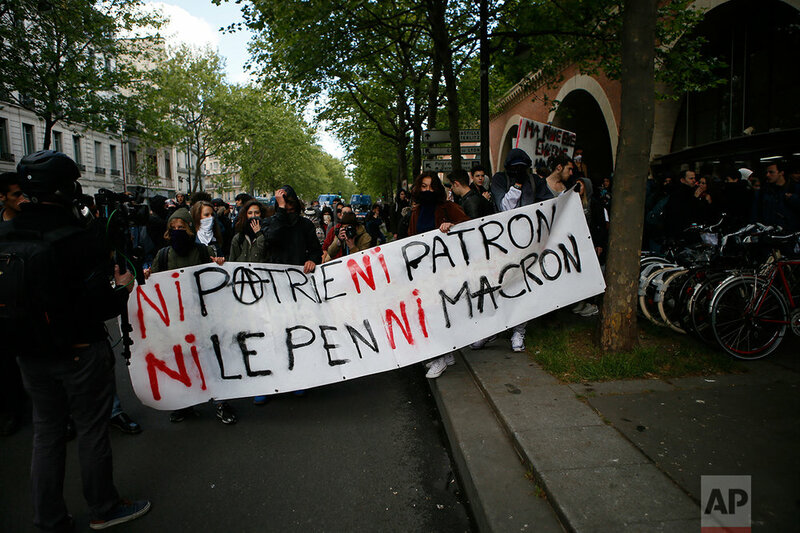 Macron said he understood that some voters backed him reluctantly, simply to keep out Le Pen and her National Front party, which has a long history of anti-Semitism and racism. After the most closely watched and unpredictable French presidential campaign in recent memory, many voters rejected the runoff choices altogether — casting blank or spoiled ballots in record numbers Sunday. Police sprayed tear gas and detained dozens of protesters holding running demonstrations through eastern Paris after the election results came out. Congratulatory messages poured in from abroad. Trump tweeted congratulations on what he called Macron’s “big win” and said he looked forward to working with the new French leader. Macron has said he wants continued intelligence-sharing with the United States and cooperation at the United Nations and hopes to persuade Trump not to pull the U.S. out of a global accord fighting climate change. Macron becomes not only France’s youngest-ever president but also one of its most unlikely. Until now, modern France had been governed either by the Socialists or the conservatives, but both of their candidates were eliminated before the runoff. “France has sent an incredible message to itself, to Europe and the world,” said Macron ally Francois Bayrou, tipped among his possible choices for prime minister. 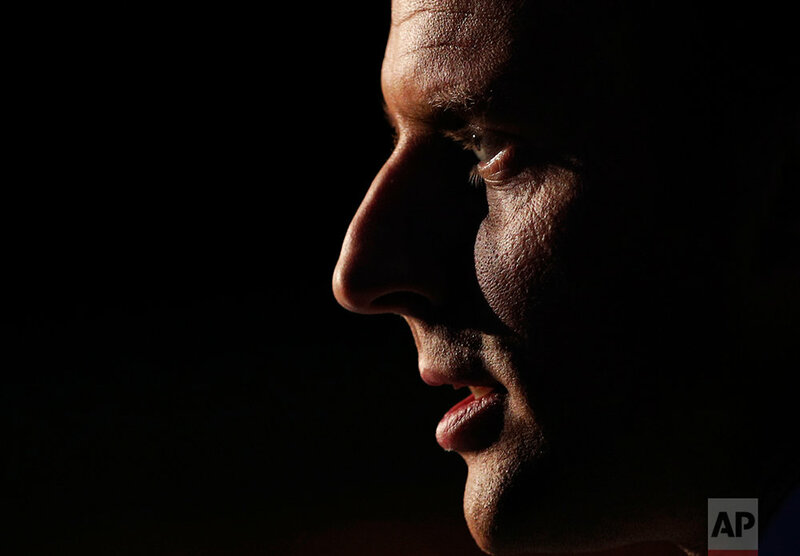 Unknown to voters before his turbulent 2014-16 tenure as France’s pro-business economy minister, Macron took a giant gamble by quitting Socialist President Francois Hollande’s government to run as an independent. His startup political movement — optimistically named “En Marche! (In Motion)” — caught fire in just one year, harnessing voters’ hunger for new faces and new ideas. Despite her loss, Le Pen’s advancement to the presidential runoff for the first time marked a breakthrough for the 48-year-old and underscored a growing acceptance of her anti-immigration, France-first nationalism. Her supporters at a National Front election night gathering in Paris put on a brave face. “Now we enter combat,” said Didier Roxel, a National Front legislative candidate. Le Pen said she won 11 million votes, which would be her party’s highest-ever electoral score. Macron and Le Pen offered polar-opposite visions: Le Pen’s closed borders against Macron’s open ones; his commitment to free trade ran against her proposals to protect the French from global economic competition and immigration. Her desire to free France from the EU and the shared euro currency contrasted with his argument that both are essential for the future of Europe’s third-largest economy. Macron also got lucky in the campaign. One of his most dangerous opponents, conservative former Prime Minister Francois Fillon, was vilified after allegations that his family benefited from cushy taxpayer-funded jobs for years. Fillon is facing charges in the case. 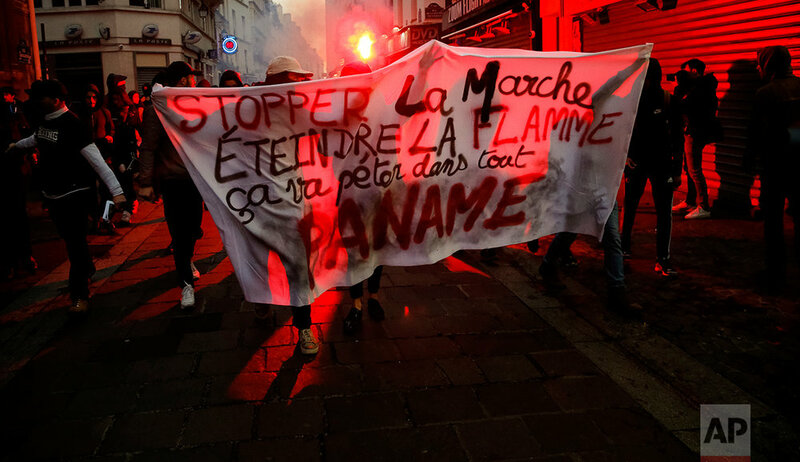 On the left, the Socialist Party imploded, its candidate abandoned by voters who wanted to punish Hollande, France’s most unpopular president since World War II. Hollande himself decided not to run again. Macron takes charge of a nation that, when Britain leaves the EU in 2019, will become the EU’s only member with nuclear weapons and a permanent seat on the U.N. Security Council. But the vote also showed that France’s 67 million people are deeply divided, riven by anxieties about terrorism and chronic unemployment, worried about the cultural and economic impact of immigration and fearful of France’s ability to compete against giants like China and Google. Macron has promised a France that would stand up to Russian President Vladimir Putin but that also would seek to work with Putin on fighting the Islamic State group, whose extremists have claimed multiple attacks in France since 2015. France has been in a state of emergency since then and 50,000 security forces were out to safeguarded Sunday’s vote. Text from the AP news story, Pro-EU Macron wins France’s presidency, Le Pen hopes dashed, by John Leicester and Sylvie Corbet. Associated Press writers Angela Charlton, Samuel Petrequin, Lori Hinnant, Thomas Adamson, Philippe Sotto, Raphael Satter, Elaine Ganley, David Keyton and Nicolas Vaux-Montagny contributed to this report.